A calendar is a great way to promote your business and upcoming events. Put into motion before the end of every year, it’s a great marketing tool with a win-win scenario: your information gets displayed along with the dates and months that your client can use and find helpful, thereby making this tool handy around all year long. Did you know? Promotional pieces that serve a useful purpose for your audience tend to be more highly valued, and therefore are used and kept around longer, giving you a much more sizeable return on your promotional investment. 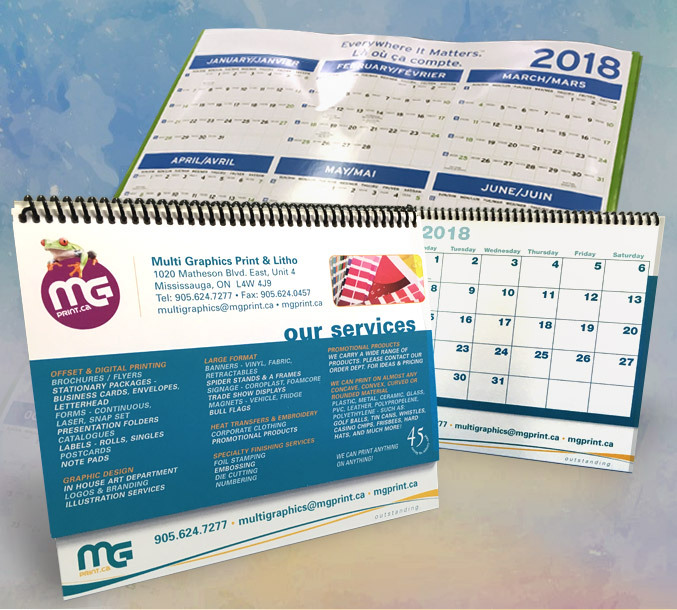 By giving out custom-printed calendars, you can help your clients and prospects with their own planning and upcoming activities while also keeping your own events or contact information on display. A relatively modest investment in a custom calendar can spotlight your brand and keep you front-of-mind for a full 12 months, if not longer. When you break the cost down over that amount of time, the price is economical and the investment is long-lasting. If you’re trying to build your business in an economical and effective manner, promotional calendars lead the pack! So, knowing that a 2018 calendar is a great way to promote your business in a useful way, how do we do that more effectively? •Reflect your brand’s personality – colour, style and format can be customized in a myriad of ways. •Feature your products or services on each page. •Reinforce your positive message and objectives. •Date boxes can promote seasonal sales, special events, annual meetings, or other specific events related to your company. •Use the empty spaces before and after the end of each month to include helpful tips or other information related to your products or useful to your clients. •Spice up your calendar by including humorous quotations or entertaining trivia – either on empty spaces or on specific dates. •With a variety of formats available (desktop, large or small wall mounted, etc.) – what can your client find most helpful throughout the year? With a little imagination and planning, you can make a customized business calendar that your customers enjoy and look forward to year after year, instead of handing out a generic calendar that might not ever make it onto your customers’ walls. Order a batch of promo calendars and show your existing clients you’re there for them – any day of the year. Then, send your calendars out to top-tier prospects in your industry to let them know that you’d love to create a mutually beneficial business relationship. Our design department is available to help you maximize your message while coming up with a format that helps you target your clients best. With the fall season in full swing, it’s never too late to get a great tool like a 2018 business calendar working for you. or call to get more information on how custom promotional calendars can work for you. Get a quote for a custom-printed 2018 calendar.